Are You Ready For Wine To Go? I am all about anything that makes cocktails more convenient. Before now I was "forced" to hide my vino in Big Gulp cups when trying to drink al fresco. Of course, I'm not supporting drinking where you shouldn't, but what's a picnic without a little wine!? No you can take your wine to go in Goverre's stemless wine glasses. These things are amazing and I cannot believe they weren't created sooner. If you're looking to sip wine at an outdoor concert, by the pool or you want to bring your own wine to a party where you know they only serve two buck chuck, this is the best thing you will ever buy. 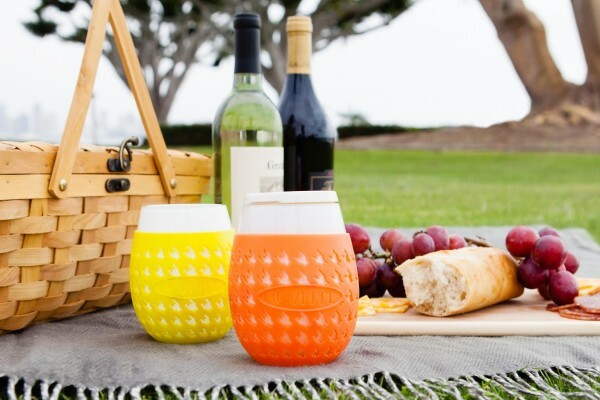 Goverre stemless wine glasses feature a silicon sleeve and patent pending drink-through lid. This is like a coffee cup for wine, people! The "glasses" are dishwasher safe and make for an amazing hostess gift. Hey, the holidays are around the corner, why not be at the top of everyone's favorite list when you gift Goverre's wine glasses to go!? *These cups may be portable but do NOT drink and drive.